8* Cappers Club Power Play on Blazers v. Thunder *18-8 Run*! Cappers Club is on an impressive 18-8 (69%) run over their last 27 ALL picks! Join the same handicapper that has made $1,000/game bettors $9,400 since May 12, 2017 with their Total on Blazers v. Thunder! No matter the sport, you know that your investment will grow with the Cappers Club. Looking for some great value? Pick up a 1-day package and get a full day of picks! It's easy to see why this is one of the most popular choices on the site. Our experts will work their asses off day in and day out in order to ensure you get the best plays in the industry. Grab a daily subscription today and WATCH YOUR BANKROLL GROW with the Cappers Club Experts on your side. What are you waiting for? Hop on the $ train today! No matter the sport, you know that your investment will grow with the Cappers Club. Looking for some great value? Pick up a 3-day package and get 3 full days of picks! It's easy to see why this is one of the most popular choices on the site. Our experts will work their asses off day in and day out in order to ensure you get the best plays in the industry. Grab a 3-day subscription today and WATCH YOUR BANKROLL GROW with the Cappers Club Experts on your side. What are you waiting for? Hop on the CLUB train today! No matter the sport, you know that your investment will grow with the Cappers Club. Looking for some great value? Pick up a 7-day package and get 7 full days of picks! It's easy to see why this is one of the most popular choices on the site. Our experts will work their asses off day in and day out in order to ensure you get the best plays in the industry. Grab a weekly subscription today and WATCH YOUR BANKROLL GROW with the Cappers Club Experts on your side. No matter the sport, you know that your investment will grow with the Cappers Club. Looking for some great value? Pick up a 1-month package and get 30 full days of picks! It's easy to see why this is one of the most popular choices on the site. YOU SAVE $899.71 off the price of 30 1-Day Packages ($1,199.70). Our experts will work their asses off day in and day out in order to ensure you get the best plays in the industry. Grab a monthly subscription today and WATCH YOUR BANKROLL GROW with the Cappers Club Experts on your side. No matter the sport, you know that your investment will grow with the Cappers Club. Looking for some great value? Pick up a 3-month package and get 90 full days of picks! It's easy to see why this is one of the most popular choices on the site. YOU SAVE $3,099.11 off the price of 90 1-Day Packages ($3,599.10). Our experts will work their asses off day in and day out in order to ensure you get the best plays in the industry. Grab a 3-month subscription today and WATCH YOUR BANKROLL GROW with the Cappers Club Experts on your side. No matter the sport, you know that your investment will grow with the Cappers Club. Looking for some great value? Pick up a 6-month package and get 180 full days of picks! It's easy to see why this is one of the most popular choices on the site. YOU SAVE $6,498.21 off the price of 180 1-Day Packages ($7,198.20). Our experts will work their asses off day in and day out in order to ensure you get the best plays in the industry. Grab a yearly subscription today and WATCH YOUR BANKROLL GROW with the Cappers Club Experts on your side. Currently on a 4-3 NHL run since 11/05/18. The Winnipeg Jets and the St. Louis Blues face off on Saturday and in this game the value lies with the Jets. All three of the Blues victories have been close winning by only one goal and the Jets are the better team even on the road. The Jets were solid on the road this season coming into this game 24-18-1 on the road and I think they force a game seven on Saturday. The REd Sox have been terrible this year, and Rick Porcello's pitching has been a big reason for that. Coming into this game he has an 0-3 record and an ERA of 11.12. Charlie Morton has been good for Rays and the Rays offense should have no issue running up the score against Porcello. The Chicago White Sox and the Detroit TIgers face off on Saturday and in this game the value lies with the over. Ervin Santana and Daniel Norris have both had their fair share of struggles this year, especially Santana. In 8.2 innings pitched this year he has given up ten runs and the TIgers should be able to run up the score in this one. Norris has been a bit better but still has an ERA of 4.32. Look for this to be a high scoring game. The San Antonio Spurs and the Denver Nuggets face off on Saturday and in this game the value lies with the Spurs. The Spurs won the last game by ten and it really could have been a lot more than that and a big reason was the way Derrick White stepped up scoring 36 points. I would expect another big game from White in this game and they should have no issue winning this game in a blowout. The Philadelphia 76ers and the Brooklyn Nets face off on Saturday and in this game the 76ers are the play on the moneyline. The 76ers dominated game three without Joel Embiid and I think the same thing can happen, even if Embiid is out again for this game. In the last two games the Nets have given up 131 and 145 points to the 76ers. The 76ers should be able to run up the score in this game and win this game. The Boston Celtics and the Indiana Pacers face off on Sunday and in this game the value lies with the Celtics on money line. The Indiana Pacers had their chance to win games two and three and chocked them away and now in game four, I don't see them having any chance. The biggest issue this whole series has been the Pacers offense. They haven't scored above 96 points in any of the games. Look for the Pacers offense to struggle in this game again. The Los Angeles Dodgers and the Milwaukee Brewers face off on Sunday and in this game the value lies wit the under. Clayton Kershaw is on the mound for the second time this season and in his first start he was lights out. Against the Reds he went seven innings giving up five hits and two runs. When Kershaw is on the mound his total is usually right around 7 or 7.5 and that is where it should be in this game. 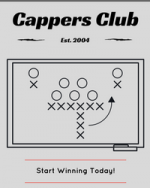 The club was formed over 10+ years (2004) ago by the experts at Cappers Picks. Cappers Club uses four experts and their statistical database to locate winning trends on a daily basis for their players. Our four cappers have over a combined 37 years of experience in the online sports gambling industry, and each day they will pour over individual and team stats, in depth player match-ups, situational trends, coaching strategies, referee & umpire assignments, offensive and defensive strengths, offensive and defensive weaknesses, ATS betting systems, outdoor sports weather factors, injury reports, and many other variables depending on the sport they have action on. Conservative money management makes for solid investments. The "Club" advises you to make the same flat bet on all your plays unless they release a 10* Top Play. We recommend betting 3% of your starting bankroll on these plays. We recommend betting 4% of your starting bankroll on these plays. We recommend betting 5% of your starting bankroll on these plays. 80% of the Club's daily picks will NOT be a 10* PICK. On moneyline bets the "Club" will never lay more than -150 on any selection. With all sports our experts advise you to shop at multiple books to get the best daily line on every bet. Picks will go up daily before Noon Eastern Time. Some days late picks will be added as we look for late action and line movement... some days picks will be added the night before. If you are looking for guaranteed proven daily winners from four experienced industry vets you have come to the right place! Our experts will work their asses off day in and day out in order to ensure you get the best plays in the industry. No matter the sport, you know that your investment will grow with the Cappers Club on your side.